I will give an overview of some of my recent work on higher-order contingentism, roughly the view that it is contingent what propositions, properties and relations there are. I first consider closely related versions of this view proposed by Kit Fine and Robert Stalnaker, and show that they provide satisfactory answers to a challenge for higher-order contingentism posed by Timothy Williamson. The formal development of the view due to Kit Fine turns out to be in need of revision, as it appeals to resources not available according to the view itself. I then consider another challenge for higher-order contingentism, namely to account for our seemingly intelligible talk of possible things which according to their metaphysics do not exist; versions of this challenge have been put forward by several authors in different contexts. It can be shown that even in extremely rich languages, the higher-order contingentist views considered here have difficulties meeting this challenge, as there are no plausible ways of paraphrasing the relevant claims concerning merely possible entities. Robert Stalnaker has recently advocated propositional contingentism, the claim that it is contingent what propositions there are. He has proposed a philosophical theory of contingency in what propositions there are and sketched a possible worlds model theory for it. Such models can be used to interpret two propositional modal languages: one containing an existential propositional quantifier, and one containing an existential propositional operator. I present results which show that the resulting logic containing an existential quantifier is not recursively axiomatizable, and that a natural candidate axiomatization for the resulting logic containing an existential operator is incomplete. Contingentists, those who think that it is contingent what individuals there are, face the following question: is it possible for relations to relate individuals there could be, but there aren’t? Higher-order contingentists, roughly those who think that it is contingent what propositions, properties and relations there are, face the analogous question for propositions, properties and relations. I argue first that higher-order contingentists should answer both questions positively: relations relate not only what there is, but also what there could be. I then show that higher-order contingentists have ways of talking about relations, properties and propositions which there could not possibly be, namely by constructing them out of relations, properties and propositions there could be. Such possibilities open up a further question: is it possible for relations to relate lower-level relations, properties or propositions there could not possibly be? I argue that higher-order contingentists should also answer this questions positively: relations relate not only what there is and what there could be, but also what there couldn’t be. Thursday 28th April, 1715 – 1900. Venue TBC. The question of whether and how evolutionary processes have shaped the human mind is fraught with controversy. In particular, the question of whether humans have any uniquely derived cognitive specializations remains essentially unanswered, in part because of our inability to adjudicate between the many competing proposals in the literature. In this talk I will wade into this controversy and ask what strategies we might use to begin to try to sift through the plethora of hypotheses about specialized mental mechanisms in humans. As a case study, I will consider two abilities that have been proposed to be uniquely elaborated in humans: our capacity to make inferences about the thoughts and feelings of others, sometimes called “mindreading”, and our capacity of moral judgment, thought to be essential for forms of large-scale sociality that humans exhibit. Using data from cross-cultural studies of cognition, I will suggest that both of these abilities are likely to be uniquely elaborated in humans, that they are likely composed of multiple components, and that these components interact in complex ways that can be mixed and matched in different ways across situations, cultures, and individuals. I will use these observations about mindreading and morality to outline a strategy for refining the search for human cognitive specializations. On Thursday 21 January we will be holding the first Dudley Knowles memorial Lecture in Political Philosophy, hosted by the Stevenson Committee. The speaker will be Professor Lord Raymond Plant, and he will be speaking on the subject ‘Religious Freedom and Identity in the Liberal State’. Everyone is very welcome. The lecture will be from 6pm to 7.30pm in the Charles Wilson Lecture Theatre (the converted church at the top of Gibson Street, very close to the Philosophy Department), and there will be a drinks reception afterwards. Everyone is very welcome; no need to book in advance. Professor Dudley Ross Knowles (1947 – 2014) was a renowned political philosopher who taught at Glasgow University from 1975 to 2012 and was a staunch supporter of the Stevenson Trust. Dudley insisted that the Trust’s commitment to public education must include the contribution of political philosophy to examining issues of contemporary relevance in a manner accessible to all citizens. In 2015 the Stevenson committee decided to endorse Professor Knowles’s view by instigating an annual public lecture on political philosophy in his memory. Raymond Plant is currently Professor of Jurisprudence and Political Philosophy at King’s College London and has represented Labour in the House of Lords as Baron Plant of Highfields since 1992. He was also Professor of Divinity at Gresham College and is a Lay Canon at Winchester Cathedral. He was previously Master of St Catherine’s College Oxford, Professor of European Political Thought at the University of Southampton and has given prestigious lecture series in Oxford, Cambridge, Dublin, Manchester and Southampton. He is well known at Glasgow University as one of our most formidable Stevenson Lecturers. Professor Plant has written extensively in political, social and legal philosophy. His range of published work on the Neo Liberal State reflects and informs his public and political service. He has been a member of the Nuffield Council on Medical Ethics and served on the Joint Committee on Human Rights for the House of Lords. He also has contributed to party policy making, for instance, by chairing reports for the Labour Party on Electoral Reform, and (for the Fabian Society) on Taxation and Citizenship. Raymond Plant and Dudley Knowles share many concerns and interests in applying political philosophy to issues such rights, welfare, political obligation and citizenship. They are also both leading authorities on Hegel’s political philosophy from whom each draws inspiration. The subject of Professor Plant’s lecture arises from reflections on the subject which began during his period of tenure as Professor at Sciences Po (the Paris Institute of Political Studies). The Edinburgh Women in Philosophy Group (EWPG) is pleased to announce that the 2015 New Enlightenment Lecture will take place on Monday, 14th December (from 15.00h in room 3.10/3.11 Dugald Stewart Building). Attendance is free and everyone is welcome. The lecture is preceded by a roundtable and followed by a Christmas dinner. 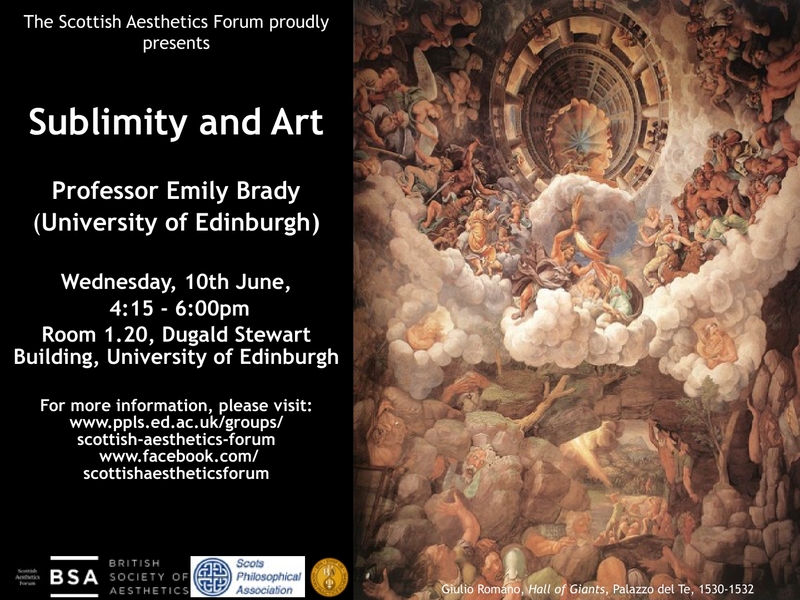 This event has been made possible thanks to the support of the Scottish Philosophical Association, the School of Philosophy, Psychology and Language Sciences and Philosophy at Edinburgh. The event is part of an annual series of lectures that started in December 2012 with the idea of providing our graduate community with women role models in philosophy. Stacie Friend (London), TBA, 5th February, 2016, 4pm. Catharine Abell (Manchester), TBA, 18th March, 2016, 4pm. David Davies (McGill), TBA, 29th April, 2016, 4pm. Abstract: The arts have an ambivalent status in the history of the sublime. Some philosophers have taken poetry, painting, and music to be sublime, while others have clearly designated the arts as capable only of representing, conveying, or expressing it, that is, somehow derivative of sublimity in nature, whether that be through visual depictions of sublime phenomena, through the language of poetry and literature, or through music. Here, I take as a starting point the eighteenth-century view that the arts, on the whole, are not sublime as such and consider it with reference to recent debates in aesthetics. I argue that (1) paradigm cases of the sublime involve qualities related to overwhelming vastness or power coupled with a strong emotional reaction of excitement and delight tinged with anxiety, and (2) because most works of art lack the combination of these qualities and accompanying responses, they cannot be sublime in the paradigmatic sense. Along the way, I discuss differences between sublimity and profundity in art, and consider the inclusion of works of architecture and some forms of land art in the category of the sublime. To contact the organisers: scottishaestheticsforum@gmail.com. 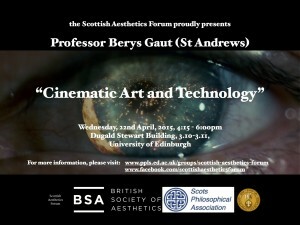 SAF is generously supported by the British Society of Aesthetics and the Scots Philosophical Association. 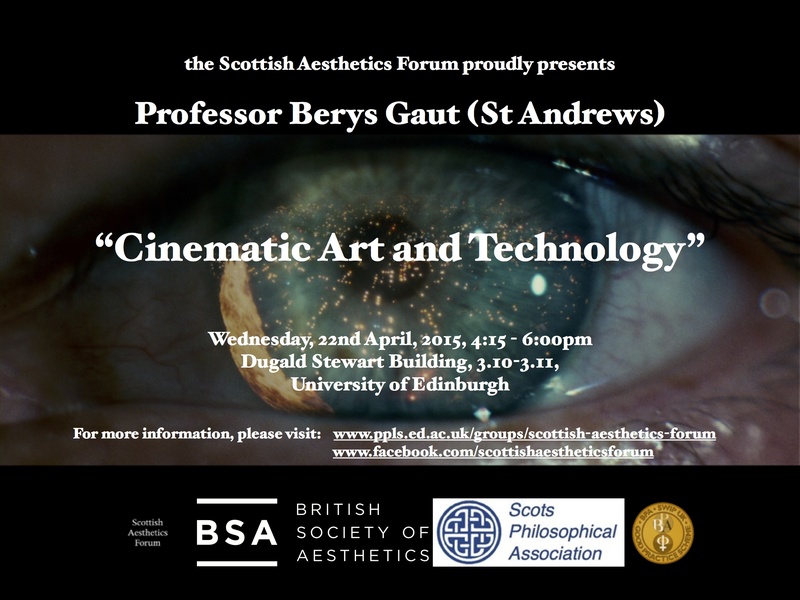 About the speaker: Berys Gaut is Professor of Philosophy at the University of St Andrews, President of the British Society of Aesthetics, and an Editorial Consultant to the British Journal of Aesthetics. His research interests and publications span both aesthetics and moral theory, and especially the relationship between aesthetics and ethics, the philosophy of film and film theory, and the philosophy of creativity. He is the author of two monographs, Art, Emotion and Ethics (OUP 2007) and A Philosophy of Cinematic Art (CUP 2010), and is currently working on a new one, Exploring Creativity: A Philosophical Inquiry. Additional information: The lecture will be followed by a dinner with our speaker. If you would like to attend the dinner, please contact the organisers by Friday, 17th April. There are limited funds to cover dinner expenses for two students, which will be offered on a first-come-first-served basis.